Indoor plants can add a special look of a room, but did you know that they also provide health benefits and reduce stress levels? Those benefits are pointless, however, if you can't keep your plant alive after bringing it home. Drafty areas as well as unfavorable lighting and moisture levels are just some of the challenges that prevent indoor plants from flourishing. When the lack of a green thumb jeopardizes the health of your indoor plants, at least there is help available. 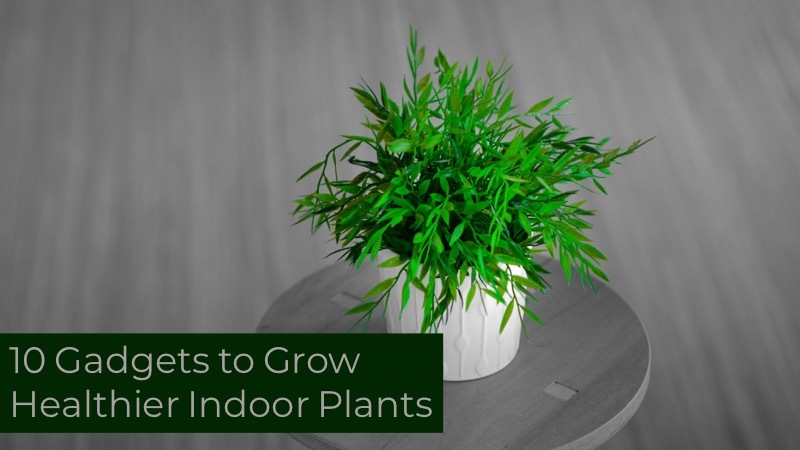 Here are 10 gadgets to help you grow healthier indoor plants! You can find home good coupons regularly updated at Coupon Cause that include savings on home & garden. Aquaphoric Self-watering Planter - This foolproof planter actually takes care of the watering for you. All you have to do is fill its aquifer to the 2-cup mark, and let the plant take what it needs, when it needs it. It comes in nine colors and is selling for $17.99. It also includes two quarts of fiber soil. E-kay Self-watering Glass Bird - Another gadget that combats the issue of forgetting to water your plants is this cute little glass bird that you simply fill with water and place in your potter. As simple as it is, it is high-tech enough to make sure you don't over- or under-water your plants. The best part is that it is super inexpensive at $7.90. Moistenland's DIY Micro Automatic Drip Irrigation Kit - This irrigation kit is completely automated, with its pump and 30-day timer. Just set up the watering schedule and let it do its thing. You'll use 70 percent less water as well, since it only takes what it needs. The kit takes less than 15 minutes to set up and can water up to 10 potted plants. It is currently going for $39.79. 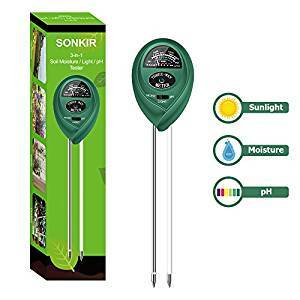 Donkit 3-in-1 Soil Moisture/Light/pH Tester - This is great for plants that are finicky about the pH level of their soil. The meter helps you determine when you should water your plant and whether it's getting enough light, plus it helps you control the soil's pH value. It's currently selling for $9.99. Click and Grow Smart Garden - This contraption is great if you like growing herbs but don't live in an herb-friendly climate. Choose from over 40 seeded capsules that you simply pop into the device's "smart soil." Just add water, plug it in and watch it flourish. The most popular version is just under $100. Miracle LED Grow Light- This one bulb has enough light to bring life to multiple plants at a time without hurting your electric bill. In fact, it can save up to $49 per year in energy and costs only $21.99. Koubachi Wi-Fi Plant Sensor - This little gadget helps your plant communicate with you, telling you about its growing conditions and sending you recommendations as needed. Consider it like daycare for your plant, letting you access its progress wherever and whenever you want. It's $100 for the indoor version and $130 for the outdoor, weather-proofed version. 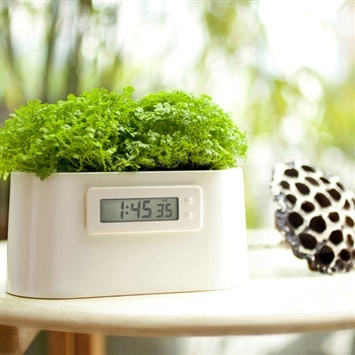 Mini Power Plant Clock- Who needs electricity when you have dirt, water and a happy plant? This clock only works when the metal rods in its soil detect moisture. If your plant is thirsty, the rods won't light up the LED display on the clock. It's quite the conversation piece at $43.69. Netamo Weather Station Indoor Module - If your plants are high-maintenance, they'll need more than just the right amount of water to survive. Even the most subtle fluctuations in humidity and carbon dioxide levels can kill some plants. This gadget monitors the conditions in your room and can even communicate with other modules you may have in other rooms. It even talks to Amazon's Alexa. The price is pretty good too for such a smart device, at $79.99. Parrot Pot - This pot can provide up to one month of watering without you having to lift a finger. It also measures sunlight, temperature, fertilizer levels and soil moisture. Available in three colors, this smart potter is currently $54.99. Gadgets like these prove you don't have to be a botanist to enjoy the benefits of indoor plants. Start with something small like the E-kay Self-watering Glass Bird, and you may find yourself moving up to more unique plants and more sophisticated gadgets. It's easy to get hooked on high-tech house plants.